Clarksdale Mississippi gets a nod from me for the second day in a row, oddly, after I read this morning that a restaurant there bankrolled by the actor Morgan Freeman, who is a Clarksdale native, is closing after ten years in operation. My meal there was about seven years ago,come to think of it, while I was doing a writing project in the Mississippi Delta and it was clear that Madidi, the restaurant which specialized in “Americanized French cuisine” (I remember it as Southern fine dining, with prices to match) would never break even in such an impoverished place. It was clearly a labor of love. Guess the cast and crew of “The Help,” which filmed in Clarksdale, also couldn’t save it from extinction. Last I heard Freeman does have another restaurant there – a popular blues bar, pool hall and restaurant called Ground Zero (see photos above). He opened another branch in Memphis, where my son and I listened to a very good female singer a few years ago. where the 2012 Oscar contenders were filmed in Hawaii and Mississippi…. When we weren’t distracted by the presence of Elton John at the table next to us during a recent dinner at a Honolulu restaurant, we chatted with an older couple sitting next to us who are natives – and I asked them where some of the scenes from The Descendants had been filmed in town. They mentioned a neighborhood a little north of where we were eating. Weeks later, a handy newspaper article offered more specifics which is good to know for our next visit to Hawaii, when I’d like to go to Kauai. The film locations on that island include: the Tahiti Nui bar in Hanalei; the St. Regis in Princeville, Kipu Rance and Hanalei Bay. The same article mentioned the film locations for The Help and darned if I haven’t been to one of those locations – Clarksdale, Mississippi. It also was filmed in another Mississippi Delta town that I think I’ve also been to: Greenwood and another town I’d like to go to Jackson and its historic Belhaven neighborhood. The performers included Elvis Costello whose Clarksdale Sessions songs were recorded at a studio in Clarksdale, Son House, and Jelly Roll Morton. I couldn’t find a recording of Robert Plant singing Walking into Clarksdale but I did find a good cover by Nanette Workman. Also enjoyed Charlie Musselwhite’s Clarksdale Boogie, and Super Chiken (a local favorite) singing Clarksdale. Might be fun to download a few of these for your trip – I think I will next time. – Listen to the blues, of course. Ground Zero club is an obvious choice. We arrived on a Sunday afternoon and Ground Zero wasn’t open just walking around the largely deserted town, we chanced upon some musicians playing inside the little Bluesberry Cafe at 235 Yazoo Avenue. They all seemed to be locals who knew each other but couldn’t have been more welcoming so we got some sodas and listened to some blues and boogie piano played, oddly, by a middle-aged white guy from the Netherlands (aka Theo D. “The Boogie Man”) who moved to Clarksdale to open a storefront rock and roll museum (which we didn’t get to: http://www.blues2rock.com/Site/Theo_D.html) ; and a older black man who sang with a weathered voice. A local favorite, Super Chikan, was there but we didn’t hear him, alas. One woman sat down with us, carrying a photo of another tourist who had visited the cafe recently – Paul Simon. That Paul Simon. Clarksdale is that kind of place. – The Mississippi (i.e. River.) – One thing that surprised me about is that it’s hard to see the river at all from lots of Delta towns which are often miles from the river, which in turn is hidden by levees. If you have time, drive about 1 hour northwest to Helena Arkansas, another struggling Delta town with lots of blues history that has fixed up its worn downtown and has a riverwalk atop the levee. 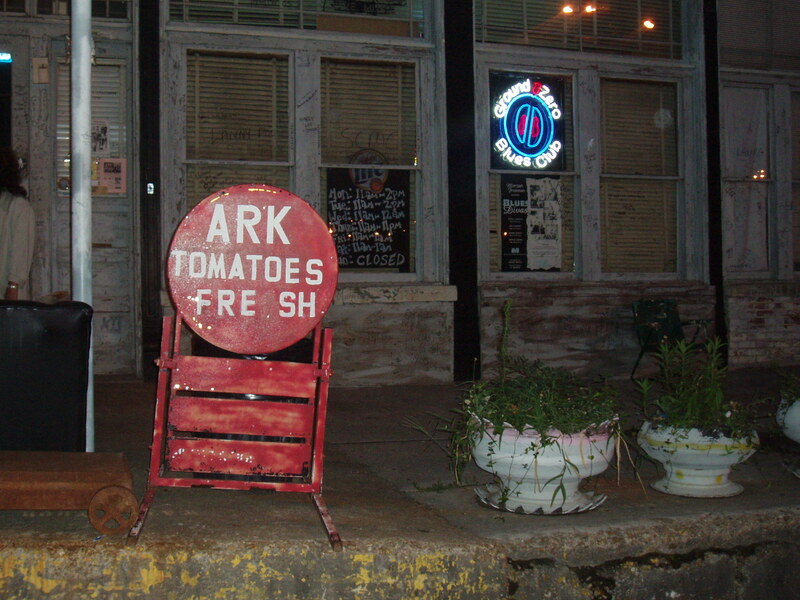 For more ideas check out the NYTimes’ 36 Hours in Clarksdale piece from 2006. – Madidi (www.madidiires.com) is a surprisingly fancy and sophisticated restaurant to find in a struggling Mississippi Delta town…until you remember that the Mississippi Delta is where actor Morgan Freeman (aka Nelson Mandela in his latest film) was raised – and still lives. He has pumped money into the area – including by bankrolling this restaurant. The food, upscale Southern, is very good but to be honest, I’d stick with some of the lower-key places, which seem more reflective of the “real” Clarksdale. – Ground Zero – This isn’t really “real” – it’s another Morgan Freeman effort but it’s designed to look gritty that it passes muster. Ground Zero is a blues club that also serves food. – Hicks Tamales and BBQ Shop – Noah and I tried several times to pick up a hot tamale here at the drive-through window but the line was always too slow (not long, just slow.) Supposed to be good though. – Delta Amusement Blues Cafe – This is a small downtown working-guys cafe, basic greasy spoon with some local character. – Uncle Henry’s Place (www.unclehenrysplace.com) – This is a very strange Southern inn about a half-hour outside of Clarksdale in a really faded town (so to speak) called Dundee near “Moon Lake.” We went here because of its history – it was a hangout of William Faulkner’s and owned at various times by the family of Tennessee Williams and Conway Twitty. The food was rich and pricey Louisiana fare and it was empty when we ate there (we arrived kind of late) which gave it an even more strange, faded feel.